AS800 high voltage inverter is an energy saving and environmental friendly IGBT variable frequency inverter designed based on international advanced electrical, electronic and vector control technologies. It offers superior motor control performance and great environmental adaptability, due to our efforts to make improvement on the high voltage inverter according to market demand. It is extensively used to control the speed of high voltage motors so as to achieve reduced energy consumption. The high voltage inverter has few requirements on electric motors and connection cables. So, an old machine can be controlled by the high voltage inverter without changing its electric motor. 1. The high voltage inverter is characterized by its flexible control mode. An inverter under sensorless vector control mode helps achieve stable motor speed control, and that under closed loop vector control mode is ideal for control of electric motors requiring accurate speed control or relatively large starting torque. 2. Due to the unique secondary coil design for the input transformer, the high voltage inverter can help reduce the harmonic pollution on power systems. It conforms to IEEE 519 Recommended Practices and Requirements for Harmonic Control in Electrical Power Systems. Meanwhile, the frequency inverter requires no power factor compensation device and harmonic suppression device. 3. The high voltage inverter comes with high efficiency. Firstly, the sine wave output current greatly reduces motor's ultraharmonics loss. Meanwhile, the primary winding of input transformer offers low ultraharmonics, ensuring a high system operation efficiency of 97% minimally. In addition, the high voltage inverter requires no output transformer, which helps reduce power consumption. And it requires no power factor compensation and has high power factor up to 0.96 or above. 4. Due to 1700V high voltage IGBT, the high voltage inverter requires less inner parts, which improves system reliability and reduces failure rates. With fiber optic isolator between the control system and the power unit, the high voltage inverter offers high anti-interference capability and safe operation. Additionally, the inverter is manufactured with self-diagnosis function, so it is capable of sending alarms when there is operation failure and abnormities. These ensure the high reliability of the product. 5. Our high voltage inverters are also energy efficient. Providing soft start function to electric motors, the inverter allows motors to start smoothly with low starting current. Meanwhile, it offers variable speed drive function to fans and pumps, etc. so as to reduce energy consumption. The high voltage inverter is applicable for not only common loads like fans, pumps and conveyors, etc., but also equipment requiring high precision speed control and large starting torque, such as plastic and rubber processing equipment, food equipment, and more. To illustrate, our high voltage inverters have been widely used to drive different types of water pumps, fans, air compressors, and belt conveyors, etc. in industries and fields such as thermal power generation, water supply and water treatment, metallurgy, cement and porcelain, air conditioning, offshore drilling platform, and more. They are also widely used in plastic and rubber processing and food making industries to drive extruding machine, mixing equipment, grinding machine, and filtering equipment, etc. The high voltage inverter is also ideal for use in pharmaceutical industry, papermaking industry and testing labs to drive related equipment. Major protection functions Overcurrent limit, overcurrent, overvoltage, undervoltage, power failure, cooling fan abnormality, grounding fault, etc. 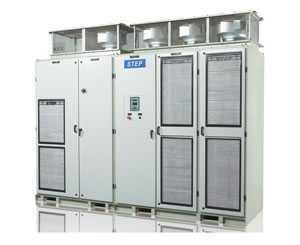 STEP is a professional high voltage inverter manufacturer in China. We provide a broad range of products including water pump inverter, full serial VVVF control cabinet, energy regenerator, elevator group control system, and more.